. : FIFA Soccer 09 :. Home / Xbox 360 game manuals / FIFA Soccer 09 :. FIFA Soccer 09 manual Just click to open it in a new window then print the manual. It's been a busy 12 months for EA Sports and football games. FIFA 08 was a genuine revolution for the series, with a more realistic pace and improved AI adding some much-needed depth to the gameplay. UEFA Euro 2008 came six months later, further refining this ground work while expanding the features list with more unique game modes. 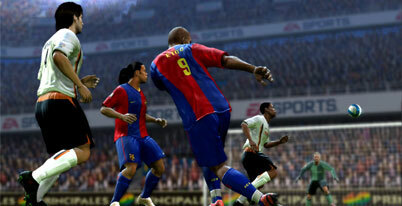 With FIFA 09--the third EA Sports football game in a bit more than a year--they've honed the core gameplay even further, and added even more features, game modes, and online elements to the mix. It amounts to an incredibly deep and varied package, and despite a few niggling bugs and performance issues, FIFA 09 is the pinnacle of the series so far. Given the six-month period of time between Euro 2008 and FIFA 09, it's no surprise that the two games play very similarly. The pace has quickened slightly, passes need to be directed with even greater accuracy, and the referees seem even more eager to dish out cards. The most noticeable improvement is in the physical quality of the players themselves. Attackers point to where they want the ball, defenders direct offside violations to the linesmen, and everyone's lost that plastic look from FIFA 08 that was so off-putting. Although you can still spot individual animation routines during replays, the players now genuinely feel as if they're interacting with each other and the ball. As a result, player weight and speed are now a vital part of overall tactics, and combining runs with perfectly timed passes has become the only real way to succeed.